Jersey Yachting provides sailing trips in Jersey waters aboard our Fountaine Pajot cruising catamaran, 'Farways'. You have the option to join our scheduled tours or to privately charter. All of our charters are skippered and crew is provided where necessary. Join our catamaran on one of our pre-arranged sailing trips. We have selected dates and times when the tides are ideal for either a short taster sail, a half day or a full days sailing. 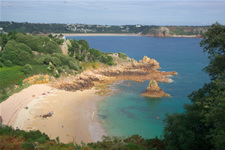 Our trips all start from St Helier and operate along Jersey's stunning south west coast, over the Violet Bank in the south east up to Gorey and all the way around the island. Families, groups and parties are all welcome aboard. Charter Farways with a skipper for your own exclusive use. We can be chartered for a half day (3hrs), full day (7hrs) or from dawn until dusk. You can pick the time of day to suit your requirements. Our catamaran provides a superb level of comfort for up to 10 guests. We can arrange food and drink for you. Private charter trips are ideal for family days out, corporate hospitality, team building, getting together with a group of friends, hen and stag parties. As the trip is yours you can choose to have a full days sailing or simply sail to one of the South coast bays, drop anchor, swim, sunbathe and dine. Perhaps you are considering chartering a catamaran for your family holiday and would like to gain some familiarity with this type of vessel. We provide 7 different training sessions to brush up your skills; the skills gained in these training sessions can easily be transferred to mono hull yachts. Please click here for more information. Our skippers are qualified RYA Cruising and Powerboat instructor - should you require any own boat tuition please get in contact. RYA training courses in Jersey can be provided by the Go-Sail school.